Taylored Expressions November Release Day: Perfect Blend! Hello! It's Release Day at Taylored Expressions which means that all of the new products are available NOW at the TE Store! 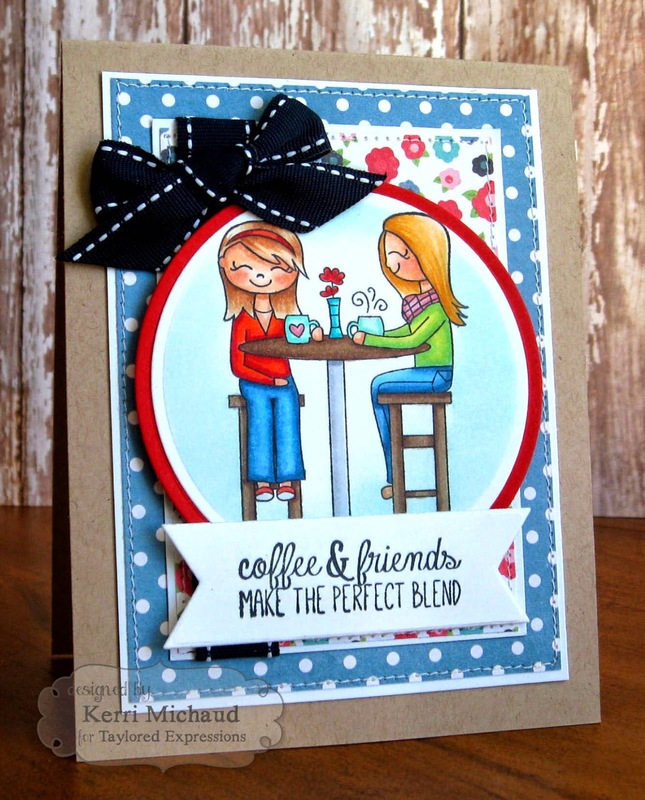 I have one more project to share with you today using one of the new stamp sets-Perfect Blend! This set is so cute and fun and comes with this adorable image and 4 different sentiments. I stamped the image with Memento Tuxedo Black and colored the image with Copics. I cut it out with Circle Nestabilities and sponged around it with aqua ink. I used some Echo Park We Are Family dp and stamped the sentiment onto a Banner Stacklets 1 Die. The layout is the Deconstructed Sketch #175. Sweet card Kerri. Love the coloring and the stitching.